After two days of friendly meetings with President Donald Trump, French President Emmanuel Macron on Wednesday took Trump's worldview to task in a rare address to a joint session of Congress. France and the United States, bound by shared values like freedom and liberty, must resist "closing the door to the world" and uphold the order they helped create without retreating to nationalism in the face of threats from globalization, terrorism, criminal states and more, Macron said. "I believe facing these challenges requires the opposite of massive deregulation and extreme nationalism. Commercial war is not the right answer," he said. Under his "America First" agenda, Trump has threatened to pull the U.S. out of longstanding international agreements and negotiate with countries one-on-one, rather than multilaterally. 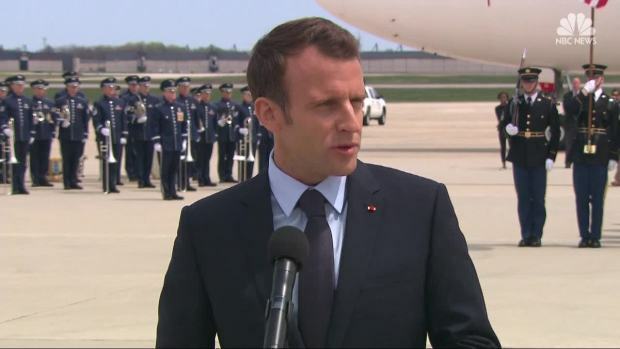 He's cut funding to the United Nations and demanded that other members of NATO contribute more — Macron noted that those organizations wouldn't have a mandate or a stabilizing influence "if we do not act with urgency, as a global community." 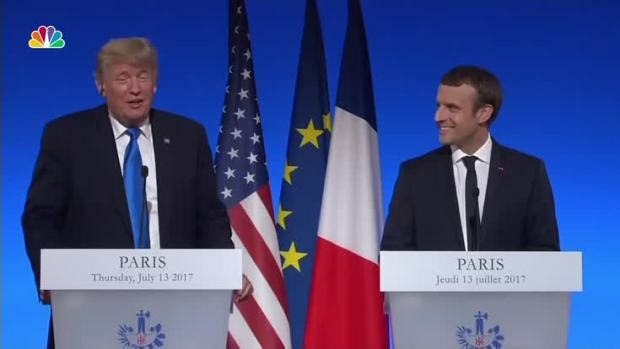 Trump has already rescinded U.S. participation in the Paris climate agreement, but Macron said "I am sure one day the United States will come back," dismissing the difference in opinion as the kind that all families have. He said he understood the fears of transitioning away from traditional energy economies that Trump has espoused, but said, "There is no Planet B." Members of Congress, who haven't had hosted an address from a world leader at the Capitol in nearly two years, were occasionally divided on some of Macron's points, with Republicans staying seated after some points while Democrats stood. Macron spoke to them all, saying they have the responsibility to show that democracy is still the best way to govern, even as their citizens experience new fears from the digital age. He said isolationism and nationalism "can be tempting to us as a temporary remedy to our fears, but closing the door to the world will not stop the evolution of the world. It will not douse but inflame the fears of our citizens. ... I am convinced, that if we decide to open our eyes wider, we will be stronger, we will overcome the dangers, we will not let the rampaging work of extreme nationalism shake a world full of hopes for greater prosperity." Macron's speech comes at the tail end of his state visit to Washington — the first of Trump's administration. Macron charmed Trump on Monday and Tuesday, as the pair talked up their close friendship and shook hands, hugged, kissed each other on the cheek and toasted each other over a lavish dinner. Trump even called Macron "perfect" after playfully brushing a bit of "dandruff" from the French leader's shoulder in the Oval Office. It wasn't clear how Trump viewed Macron's speech, which he'd said he would be watching. "Looking forward to watching President Macron of France address a Joint Session of Congress today. This is a great honor and seldom allowed to be done...he will be GREAT!" Trump tweeted Wednesday morning. Macron came to Washington to solidify his close relationship with Trump and to try and convince him to stick with the Iran nuclear deal that Trump has derided from the campaign trail to the White House. After a couple of meetings, Trump declined to say whether he would withdraw the U.S. from the international Iran accord, which restricted Iran's development of nuclear weapons in exchange for the lifting of some sanctions. But Trump said Macron knows what he plans to do, and hinted at the possibility of a new deal. On Wednesday, Macron laid out his reasoning for why the U.S. should stay in the deal, which runs through 2025 — doing so could destabilize the region and possibly lead to war — but put forth a framework for building on the agreement so it limits Iranian adventurism among neighboring countries and prevents the country from ever getting nuclear weapons. Nevertheless, Macron told reporters Wednesday night that he expects Trump to scrap the Iran deal and is working on mitigating the damage, NBC News reported. The last foreign leader to address a joint session of Congress was Indian Prime Minister Narendra Modi in June 2016. Macron was the seventh president of France to do so.